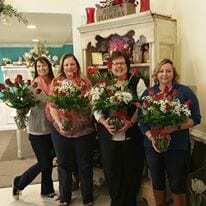 Connect with your girlfriends at our locally-owned shop surrounded by the sight and smell of fresh flowers, and get in some girl talk! Meanwhile our designer is on-hand to guide the group through your design, make sure everyone leaves with something beautiful they are proud of, and answer any general questions about flowers and our industry. Let us create a custom design party for your group on a weeknight or weekend, lasting 1-2 hours, beginning at $40 per person and up, all tools and supplies provided. Do you have a special occasion coming up, worthy of “doing it up” properly? Bring your group on out and your own wine to our locally-owned flower shop and celebrate surrounded by the site and smell of fresh flowers! Perfect for bachelorette parties, celebrating a new job or engagement, or an existing group looking for a new experience, such as a wine club, ladies group or book club. Our designer is on-hand to guide the group through your design, make sure everyone leaves with something beautiful they are proud of, and answer any general questions about flowers and our industry. Let us create a custom design party for your group on a weeknight or weekend, lasting 1-2 hours, beginning at $40 per person and up, all tools and supplies provided. Whether you have an event coming up and plan to “DIY” your own flowers and need some guidance from the experts or simply have always wondered how those gorgeous floral arrangements are created, this is the forum for you! Come with a friend, mother/daughter, etc to our locally owned flower shop where our experienced designer is on hand to guide you through your design, make sure you leave with something beautiful you are proud of, and answer any questions about arranging, mechanics of design, fresh flowers and our industry. For beginners or those with any level of design experience, join us on a Saturday morning for one design session or several, lasting 1-2 hours each, beginning at $40 per person and up, all tools and supplies provided. You provide the space, we take care of the rest! Need to bring your colleagues together to network, for team building, or just to say thanks for their hard work? Do you have an activity room, such as at a retirement or apartment community? Or maybe you’re switching up the Christmas Party at work this year? Our designers will come to you with all tools and supplies needed, take care of setup and cleanup, and guide your group to be sure everyone has fun and leaves with something beautiful they are proud of. Appropriate for beginners, let us create a custom event for your group on a weeknight or weekend, lasting 1-2 hours, beginning at $55 per person and up. This option is also available in a Demo/Seminar Format. This is not hands-on, rather a presentation for your group to learn about a particular topic. We have done presentations for many religious groups, Ladies’ Clubs, Mom’s Groups and the like. These demos start at $40, depending on the time of day, day of the week and topic. To book or inquire about one of these Series, please email us at: staff@caryflorist.com.